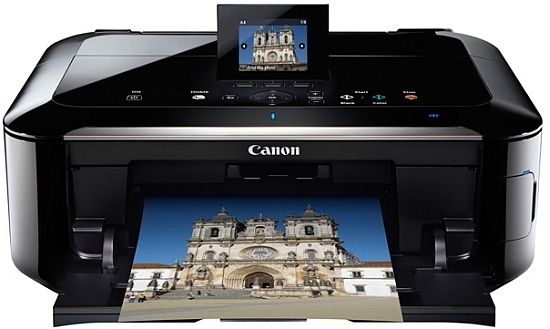 An excellent choice for amateur photographers as well as home office use, the Canon Pixma MG5320 fairs well in the all-in-one market, featuring copy, print, and scan capabilities, plus direct to CD printing and Wi-Fi networking. The Canon Pixma MG5320 also integrates several plug-ins for tweaking photos, making it perfect for producing holiday cards, invitations, and other creative projects. The new software includes HD Movie Print and a wide range of photo filters. Running cost can be a little on the high side, as the printer only accepts low-yield cartridges. Thinner than other Canon Printers, the Canon Pixma MG5320 definitely has a smaller footprint, especially with its uniquely designed folding trays. There is a comprehensive control panel right on top with excellent button layout, and a 3" LCD screen for accessing basic functions and stand-alone printing options. It supports wireless connectivity, something that the older MG5150 did not do, but still uses a USB port for direct PC-to-printer connection. The Canon Pixma MG5320 can print direct to DVDs and CDs, and hits the sweet spots of amateur photographers with its 9600x2400 dpi maximum resolution. Canon has also added different photo-friendly features and PictBridge support for direct-from-camera printing and auto-enhancements. It boasts impressive print speeds of up to 7.7ppm for plain texts. Overall, the Canon Pixma MG5320 is a decent buy. It does not come with Ethernet interface for wired networking, and with the lack of high-yield cartridges, running costs can be expensive.